Miss Kitty was a darling to more than one family. Because of this, there will be letters in memory of her by her adopted family (Melodie Day) and her foster family (Victoria & Rick). I am the “mommy” to several cats that have come from ‘Holly’s Place’…Albert, Miss Kitty, Tess and Oliver (Runt)…I have been the “mommy” to several cats over the years…But few have touched me like Miss Kitty. Miss Kitty came into my life like a tornado…she was originally adopted for my daughter who had recently lost her beloved Persian cat Gypsy…unfortunately, Kacee wasn’t ready for another addition to her life…so Miss Kitty stayed with my husband, son and I. She was the Betty Davis of cats…raspy voice, huge eyes and the attitude…my god, there isn’t another attitude like hers and I’m sure that no other cat could ever mimic what she had. She was a pushy broad, initially she would bite and scratch…not wanting anyone to touch her. Then, whether it was fortunate or unfortunate for the person involved, she would PUSH and SHOVE her way into your heart. Always on your lap, expecting attention while I was on the TOILET…and making “biscuits” on my belly…she beat up the dogs, and on occasion she beat me up as well…she wormed her way in and wrapped herself around my heart like no other cat I have ever had. Miss Kitty was a tamed feral, one of a kind, and very special to my family and I…This morning she passed away unexpectedly from a stroke secondary to a seizure…She was my angel unaware, and she will be greatly missed, especially when I need a nice quiet chat or just a friend. But most of all she will be missed as a very important part of my family. We will always love our Miss Baby-Baby. I’m sitting here thinking of Miss Kitty and her Betty Davis eyes and voice, and all of her little foibles here. I wonder how much I ever told you about her life before you took her. I thought it may be healing to do so now. We moved here in 1998 and there were tons of feral cats living under our house. At some point in 1999, I think, we began to notice Miss Kitty. At the time she was completely feral and wouldn’t come anywhere near us. And then we noticed she had one kitten, Sammy. He was also feral. I was determined to tame him, though, so that we could find him a good home. One day, while Miss Kitty hissed and spit at me, I stole Sammy from her. She mourned the loss of him, though, and would be crying at the windows. So I took Sammy over to the window one day to show her that he was safe. That was all she needed. She stopped crying and went about her business. She was sort of paired up with Bud, a tame cat here. Eventually we brought Bud inside, and Miss Kitty seemed to always be on the porch or deck. But while Bud was outside, when we’d pet him, we’d play “sneak a pet” with Miss K. By this time, she was willing to get within a few feet of us. As she was loving on him, rubbing up against him, we’d pet him, and then sneak-pet her. She’d turn around and hiss and run. We did this for months and months. Eventually we trapped her and had her spayed. She had a big red X on her file at the vet because of her behavior toward them! Anyway, one day she simply jumped in Rick’s lap on the back deck and said, “I don’t want to be feral anymore.” And she became the most loving lap cat of any of them. Before we pulled her in, when we would go out on the back deck at night, she’d come running, whether it was snowing, raining, or sleeting. And she’d want attention. I remember one night her showing up with icicles hanging off her beautiful long hair. Another night she was drenched from rain and looked like a drowned rat. It was so funny because she looked so awful, but she still acted like she was this beautiful Hollywood actress. We kept trying to bring her inside. After her spay, we did, and she had a fit. I finally let her back outside after I discovered in the middle of a class at UK one night that the baseball cap I was wearing had been peed on! I went home and found that Miss Kitty had been peeing everywhere, just to show me how upset she was. In the fall of 2000 I decided to bring her inside no matter what once I realized that she was beginning to trust people other than Rick and I. With Halloween coming up, I was worried about her. So Miss Kitty came inside in October of 2000. This time, she was ready to, and stopped pulling shenanigans like peeing. Still, she wanted to be able to go out from time to time. One night we came home in the dark and as I approached the front porch I saw Isaak, one of the fosters, outside. I grabbed !him up, and shaking, ran inside. Half of the fosters were gone, including Miss Kitty. She had pushed and bent the screen out of the window and let everyone escape! We eventually got everyone back inside, screwed the screens in this time, and scolded Miss Kitty. Of course, she scolded us right back with that raspy voice of hers. You know the rest of Miss Kitty’s story. We will never forget her. We all still joke about her voice all the time, mimicking it. There just will never be another cat like her. In a lot of ways, she paved the way for so many of her kind at Home At Last and now Holly’s Place. Because of our success with her, we were willing to take Bobbie, the 3 legged feral. 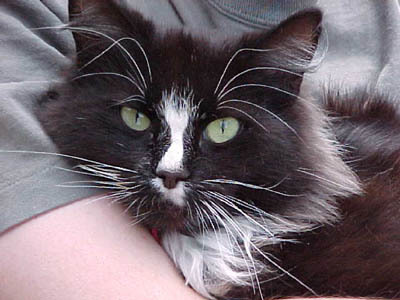 Because of Miss Kitty, we believed that we could and should start helping feral cats in some way. And we have ever since. I forgot to tell you some other stories. My husband and I were talking about the screen holes, and he said, yeah, she could fit through some tiny holes. One night we had gone to bed and I kept hearing a cat crying. We got up and tried to track down the sound. Miss Kitty had crawled through a small hole in the cover of our old coal fireplace, and then trying to get out, she ended up pulling an afghan through the hole and completely blocking it. By the time we figured out where she was and got her out, she looked like a solid black cat, with coal dust covering her! When she had been outside she used to taunt my cats through the sliding glass door and smack at them. When we finally brought her in, the one she taunted the most went straight after her and she ran up my living room curtains. She was swinging from the curtains, crying when I ran in. In mid-swing, she lost hold, though, and toppled down behind a book case! I felt so bad for her. And she hated it when I groomed her. The one time I really did some major clipping to get mats out, she kept smacking me and ended up causing me to cut a big hunk of hair out of the side of her face along with all the whiskers on that side. She was lop-sided for a while. And part of the reason I eventually brought her in is that while I fed the birds, she was out there killing them. I’d yell at her as she climbed the trees trying to get to the bird houses, and she’d just look back at me defiantly. Nearly everyday she brought a dead bird, frog, mouse or mole to me. As I mentioned before, she had a “boyfriend” named Bud. When they were both outside, my husband saw Miss Kitty go after a squirrel. She didn’t realize it, but Albert (the dog next door) began to chase her. Well, Bud protected his little woman and went after Albert. So here went a squirrel, Miss Kitty, Albert the dog, and Bud. Rick had to run and break it up because Bud was in the process of hurting Albert. Albert never went after any cats again, though.